On Tuesday, 9th September, at the Kawasaki City press club located inside the Kawasaki City Hall, Noriko Ogawa held a press conference about the upcoming 12th Jamie’s Concert. Noriko, pianist and founder of Jamie’s Concerts (see About Jamie’s Concerts), talked with excitement about the concerts’ genesis, history and their achievements, and answered questions by journalists. 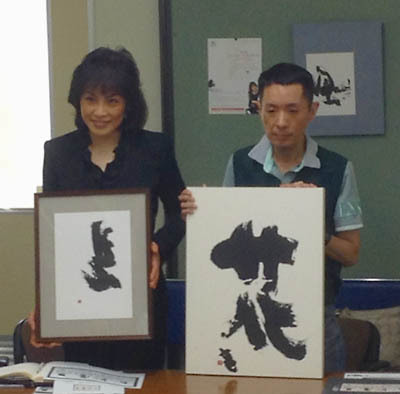 At the press conference, Mr Tatsuhiko Sezaki, an autistic calligrapher, also promoted his exposition “SHINGA” (free entrance), held between the 7th and 12th of October at the same time of the 12th Jamie’s Concert at the Muza Kawasaki Symphony Hall. Please visit the Muza Kawasaki Symphony Hall’s facebook to see the report of the press conference (Japanese only). Living with autism – Mrs Ogawa, originally from Kawasaki, gives concert to support the parents on 7th Oct. at Muza Kawasaki. Support for disabled children’s mothers through music – Kawasaki hosts “Jamie’s Concert” in October.